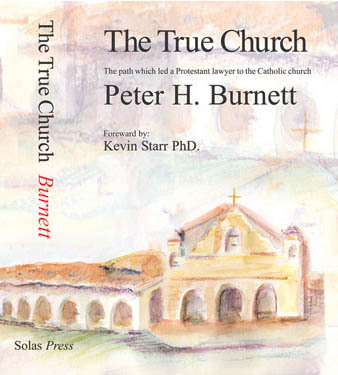 Foreward by: Kevin Starr Ph.D.
Peter H. Burnett’s The True Church is a model for ecumenical dialog. He was in turn an unbeliever, a Deist, a Disciple of Christ, and a Catholic. He thus does not assume any particular faith in his reader. Burnett adopts the practice of treating evidence like figures in the jurisprudential tradition such as William Blackstone, Thomas Starkie, and James Kent. On this rigorous basis he develops positions on the truth of Christianity and uniqueness of the Catholic Church. In the process, he meets the arguments of a group of notable believers and un-believers. As the occasion demands, he marshalls sources such as Hugo Grotius, David Hume and Samuel Johnson, as well as a vast array of Divines.